To develop the powers of conviction and persuasion is difficult, especially if you are going to have a startup of your own. But if you want people to work for and with you, knowing how to nail that is an absolute must. When you create a solid argument and show people that you care about their needs and interests, they are automatically interested in being with you. And in case you are worried about convincing people to join your start up, then this post would be perfect for you. All the best tips and suggestions have been enlisted in this post just for you. You have to learn to sell the dream if you want people to join your startup. As a founder you have to be convincing. If you want people to work for the company so that they can help you make the change you are looking for, make sure to speak to them about the opportunities the company has to offer. Speak about some of the unique strengths it has and how financially it is trying to improve. It would make a very good impression on the person and they would definitely think of giving this a shot. The employees who work with you have definitely planned the vision from beforehand. So what happens is when they begin to look for other good candidates, you can always inspire them to share why they should look forward to your company and how great it would be to be a part of an organization that is so successful and promises profits only. A company that is always innovating itself is definitely going to create a good impression in front of others. 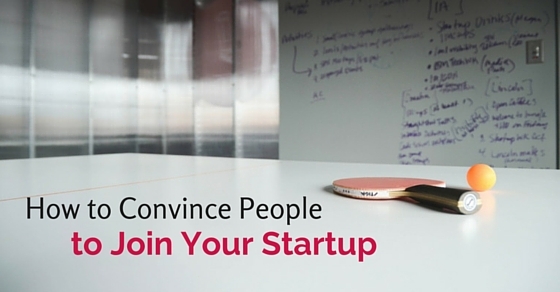 And in that way, more people will be convinced to join your startup. Several people these days liked to join companies based on the culture of the company. They prefer to go for a company that offers great business opportunities with proper cultural background and ethics. So when you are trying to convince someone to join your startup, tell them that you would like to invite potential candidates for the happy hours that occur every week. This will allow all of them to meet the team members and in that way they will begin to experience the broad culture of the company. When you begin a startup people will be slightly hesitant to join, but you can change their perception by telling them it’s a good chance to make money. Even though you can’t pay them a whole lot of money in the beginning, you can tell them to own some portions of your company. In that way, when the company makes money, they make money too. Also when you make an offer, try to combine both salary as well as stock options. It will definitely turn their heads towards you. Everyone wants to work in a company that has fun loving people. So try to convince them that the people they will be working with are smart and promise to make the work place a lot more interesting. And of course, great teams can certainly be found anywhere, but it is better to speak about it if the company is small, like a startup. Sometimes you should take your candidates out to coffee, dinner or some other place to grab drinks. When they are in a casual environment, the candidates will feel better. You should also make yourself look like a rare person. Convince people in such a way that what you have to offer is hardly available at ease these days and if people miss out on it, they will actually miss out on something great. This could actually work and make people want to work with you. Plus it is a natural tendency among most to want what they can’t have. It is a psychological guide and has always triggered something among people. So use this as an effective technique to get what you want. Try to match your body language, speaking style and the words used with the people you hope to convince. Yes, opposites do attract but if you want to persuade someone, you should try to be who they want to see you see. The technique is effective among groups of people as well. Try to understand the room and the people, before you begin speaking. See what makes them feel positive about things and what attracts them the most. And who knows? They all might want to apply to work for your company. So every time you are trying to speak to someone and you use verbal filler like “uh” and “uhm”, people are slightly turned off. Plus you tend to lose credibility to the person you are trying to make sense too. It doesn’t even matter anymore if what you are saying makes any more sense or not. So make sure you are clear with what you are saying and try to maintain the flow of the speech. The best way you can make this happen is by simply practicing some at home. Confidence matters a lot when you are trying to convince someone. People are always attracted to confident people so make sure you have that selling point. Be sure of what you are saying and make sure all the plus points are mentioned. You shouldn’t come across as aggressive but assertive. People should like to hear what you are saying. They should be attracted to your words as well. You need to master the art of timing if you want to attract people. Study them and see when would be the right time to speak to them. There are some people who are often swamped in other work that they don’t have time at all. You shouldn’t speak to them when they are working. So if you see they are blocked on a Thursday, try to contact them on a Friday or during the weekend. People should have the time to speak to you. Pick up the right timing to speak to them and you will definitely be successful. Let your candidates know that this could be a good opportunity to go out of the box and do something that is interesting and unexpected. Even if it is the aim of the company to go a bit altruistic, make it a point to spend some time with the people and talk to them about how excited and happy you are about this new building you guys are going to create. It could be a fun game and a great opportunity to share and speak what’s on your mind. You could be very successful with this one. When you speak of the future with confidence, people are bound to be convinced. It will let the person know that you are serious about the start up and are looking forward to carrying it out. You should use words like “will” and “we”. It will automatically create a feeling of unity and solidarity. Then once you have done that, try not to be pushy at all. Also do not make the decision for the other person. Speak about the possibilities and the decisions you need to make for the future. When you are speaking to the candidate or the person you want to convince, try to mention the ways in which they can make contributions towards the company and how effective it would be for you to have them play a major role in your company. This will give the candidate the impression that they can run the company with you someday. It would definitely act as a plus point. So make sure your chatting skills are on point. Your marketing strategy should be good enough to excel too. Convincing people to do anything is tough. Several small companies have rose to success while some have failed miserably. So it can be a little difficult to influence someone to join your team. If you follow these tips and suggestions, half your work will be done. So make sure to follow them all and do give us some feedback. We would love to hear how this post has benefitted you. Plus if you have questions in mind, feel free to drop a comment below. We will try our best to answer all of them. Next articleCan you leave a Job after 2 or 3 months? Is it OK to QUIT?